On arrival, our representative will assist in your smooth transfer to Genting Highlands. Begin your Genting trip package positively with a 30 min stop at Batu Caves, a Hindu shrine with a huge statue of Lord Murugan. Stop at the longest and fastest cable car in South-east Asia and ride above the tropical rainforest. This takes you to the peak where Snow World awaits to make your Genting highland travel package chillingly memorable. Bid adieu to your Genting highland trip package as you move to Kuala Lumpur after breakfast. With a half day sightseeing tour, drive past National Mosque, the National Monument, photo stop at the Petronas twin towers, the superb buildings at the Independence Square, Chinatown and Parliament House; photo stop at the King’s Palace – residence of the elected king of Malaysia. Later, check-in to your hotel. You have the rest of the day at leisure. The full day is free for leisure. You may opt for Sunway Lagoon tour (optional). It is an amusement park with 6 different experiences; a perfect choice for all age groups. You can then visit the night markets for street shopping and food. Check-out of the hotel and proceed to the airport as you take back fond memories. The exciting, surprising and enticing city of Kuala Lumpur welcomes you with a steady cultural mix of its popular Malaysian cuisine, world-famous landmarks, a bustling neighbourhood yet surrounded by lush greenery. There are various structures to marvel in the form of the world’s tallest twin towers, beautiful mosques and buildings influenced by the British colonial times. 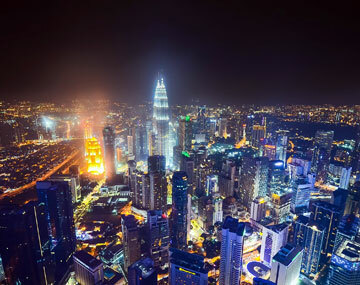 It’s easy to lose track of time here with a Kuala Lumpur tour package covering so many different experiences. Genting Highlands, at around 6000 feet above sea level, is a mountain resort which acts as a quick getaway from Kuala Lumpur. The best part about a Genting Highland tour package is that you are in for a treat with theme parks, games and Malaysia’s only casino. Revel in the cool mountain air as you try a host of adventure activities. Our Kuala Lumpur day tour package is curated in such a way that you don’t miss out on any of the key attractions. You will be able to click photographs around iconic places and capture precious moments. With a Genting Kuala Lumpur package, one always expects diverse experiences. Our Genting travel package ensures the same and fulfils all your expectations. You can enjoy yourself through the day indulging in as many activities as you want with being rest assured of a quality stay with our Genting tour package. High season surcharges will be applied accordingly. Payment will be at the prevailing Rate of Exchange (R.O.E) on the day/date of booking. Rates are liable to modification without prior notice. Rooms/Seats depend on availability at the time of booking. Take note that the drivers are not guides. Confirmation of Hotels and other services depend on availability. Normal check-in time is 14:00hrs and check-out time 10:00hrs. Early check-in and late check-out depend on availability. Itineraries are liable to change. Cancellation charges will be accounted for as per company policy. If we are unable to offer the hotels as mentioned, then we shall offer similar hotel substitutes.Modified costs if any will be advised. Passport copies of all the passengers are necessary to commence booking. We will not be liable for claims or spends connected to conditions beyond our measures such as accidents, injuries, delayed or cancelled flights & acts or forces of nature.